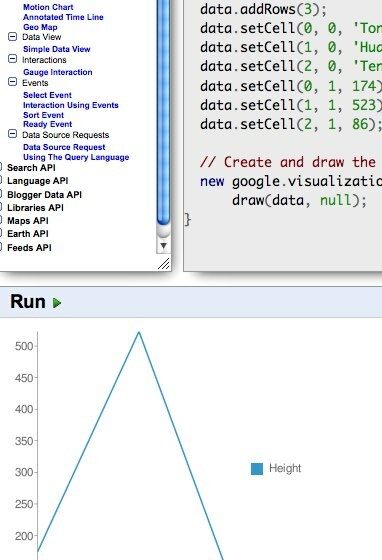 Google's AJAX APIs Playground is an awesome new tool recently released by Google. It allows you to browse through their various APIs and view examples. This is a great way to see what the Google APIs have to offer and get a quick example of each. Even better, each example can be executed, modified and re-executed right on the page. The final source your create can be copy and pasted, and each API has a link to the documentation. Definitely head on over and check it out. I follow various Google developer blogs, but I was quite suprised to see the breadth of their API offering. Graphs, maps, search, blogging and more are all included, with great examples and an excellent interface.